Welcome to the Optimist Club of Cooper City! For more than 40 years, the Optimist Club of Cooper City has been a 'Friend of Youth'. Each year, some 5,000 participants take part in the seven sports our club has to offer. Our fields, diamonds, courts and rinks are breeding grounds for young minds and bodies. The Optimist Club of Cooper City promotes good sportsmanship and healthy competition. Parents are encouraged to become involved with the various programs to help ensure its continued success and maintain its family environment. 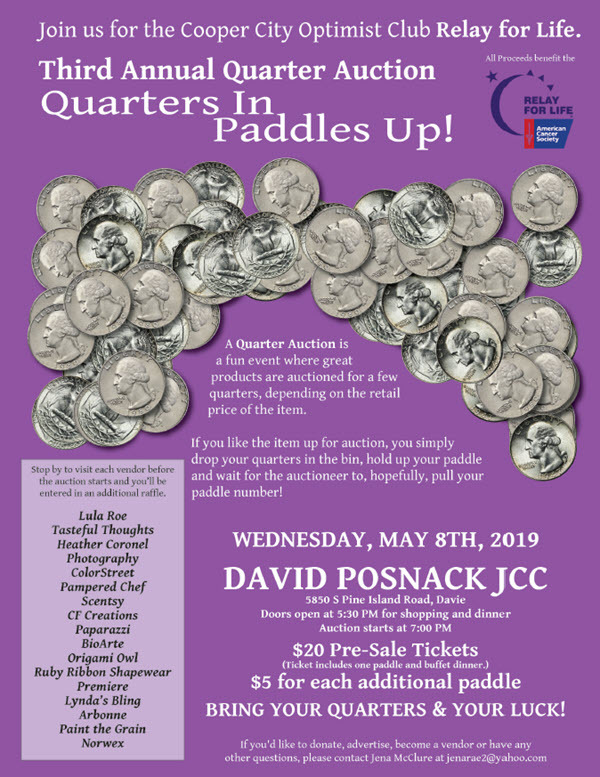 Please join our Relay For Life team and participate in our 3rd Annual Quarter Auction FUNdraiser. Come have fun & help raise money to fund the cure one quarter at a time! Are you interested in being a Golf Classic Sponsor? For more information or to become a Golf Classic Sponsor contact Pete Schlang at the Golfer Hotline. Children are not allowed to attend General Meetings.